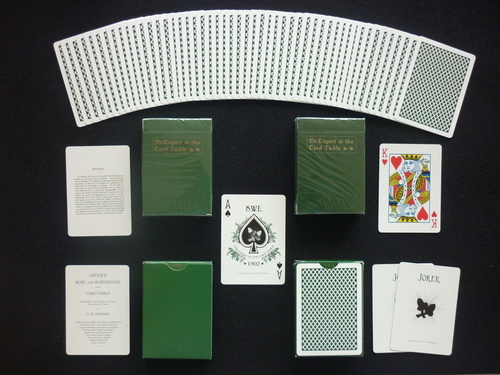 Bee Erdnase "Expert At The Card Table"
This deck was inspired by S. W. Erdnase's book "Expert at the Card Table", which was published in 1902. It is printed using the same color green as the original 1902 book on Aristocrat stock using the Bee diamond back design with white borders. They have been printed in two different runs, the first features the back design on the back of the box, while the second comes in an all green box as well as the gold ink on the front being a slightly darker shade. Comes with 2 custom jokers, a custom Ace of Spades, and two info cards printed to look like pages from the book.